The 5 am National Hurricane Center (NHC) Report has indicated that the risk for a direct impact from Tropical Storm Florence has increased, although exactly where on the East Coast remains uncertain. Residents of the East Coast should be on heightened alert for the potentially dangerous storm, which is expected to become a major hurricane again in the next 12 to 24 hours as it approaches the US. Still almost 1,500 miles from North Carolina's Outer Banks, the tropical storm remains 5 to 7 days from a direct US landfall, according to the NHC. As of Saturday morning, Florence had winds of 65 mph and was moving to the west at 9 mph. The center of the storm was about 840 miles southeast of Bermuda. The latest NHC forecast shows Florence approaching the US East Coast as a powerful Category 4 hurricane with 145 mph winds early next week. Heavy rain could cause catastrophic flooding well inland from where the storm makes landfall, which is possible anywhere from Florida to New England, AccuWeather said. The path of Florence is likely to remain steady for the next several days, but a deviation in the storm's trajectory could develop as it approaches the Eastern Seaboard. "An area of high pressure over the central Atlantic will bridge westward and join with an existing high pressure near the U.S. East coast over the next several days," said AccuWeather Hurricane Expert Dan Kottlowski. If the high-pressure area weakens next week, then Florence could curve northward then northeastward out to sea with impacts in the US limited. However, Kottlowski said if the high-pressure remains strong, then the storm would make landfall somewhere between the Carolinas to southern New England sometime during Wednesday or Thursday of next week. The Weather Channel said that "all interests along the U.S. East Coast from Florida to New England should monitor closely the forecast of Florence. If you live in a hurricane-prone location, make sure you have a preparedness plan in place now, before any watches or warnings are issued." The hurricane center warned that "swells generated by Florence are affecting Bermuda and will reach portions of the U.S. East Coast over the weekend. These swells are likely to cause life-threatening surf and rip current conditions." If you have not been paying attention, the tropics are extremely busy right now. There could be as many as three named storms in the next several days. The pipeline is full! Hurricane Florence is likely next week, then Helene and Isaac have moved into the tropical Atlantic, and a couple more tropical waves in Africa are moving west. 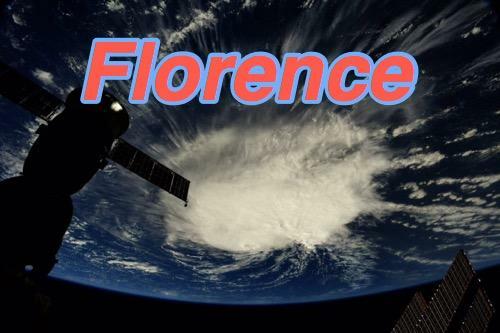 While it is certainly not time to press the panic button — by the end of the weekend, meteorologists will have a better grasp of where Florence is headed. As of right now, models show the East Coast could get slammed.